Hello from Vegas! Even though MAGIC MARKET WEEK doesn't officially start until tomorrow, I spent the entire day walking the show floor with other bloggers prepping for a week of work and play. We managed to sneak away for a palate changing lunch at Lotus of Siam, arguably one of the best Thai restaurants in the western hemisphere. Proof of its legit status is flagged by the fact that although located in a deserted strip mall far from the strip, the restaurant is frequented by top chefs and celebrities alike. My favorite dishes were the deep fried prawns (crispy on the outside, fluffy on the inside) and the meltingly tender crab fried rice. However, I must admit its extensive menu leaves me craving for more and a second trip before week's end may very well serve as a happy ending to tMAGIC. A barrage of show related social media updates and blog posts are forthcoming so please stay tuned. In the meantime, here's what I wore in LA a few weeks ago. I needed an outfit that would take me from a daytime Joico press preview event at the SLS Hotel to a nighttime Puffs beauty event hosted by Tia Mowry (Sista, Sistaaa) at Blushington. So, I settled on a classic blazer and shorts combo that's anything but classic in color, texture, and form. I don't particularly love cropped blazers as they inevitably shorten my frame and will only wear them layered with flowy shirts for a proportion balancing silhouette. I threw in a strikingly bright orange and pink brocade shorts to brighten the maroonish severity of the color palette and added black tights and wedges for some color balance. As I'm writing this, I'm also brainstorming topics and questions for tomorrow morning's MAGIC Daily Show all the while sneaking wistful glances at the view of the Vegas strip. I must shut the curtains and remind myself it's imperative to work now so I can play later. Reap and you shall sow. thanks for your comment. great blog. would you like to follow each other on instagram and GFC? Great look! loved the shorts! cute shorts, love the way you styled them. That skirt is very classy ! I'm in love with this leather shirt. Hope you have an amazing time in Las Vegas! you are gorgeous! love the mix of textures and colors! great outfit! wow like your shorts, very nice. Love you burgundy and brocade mix...lovely outfit! 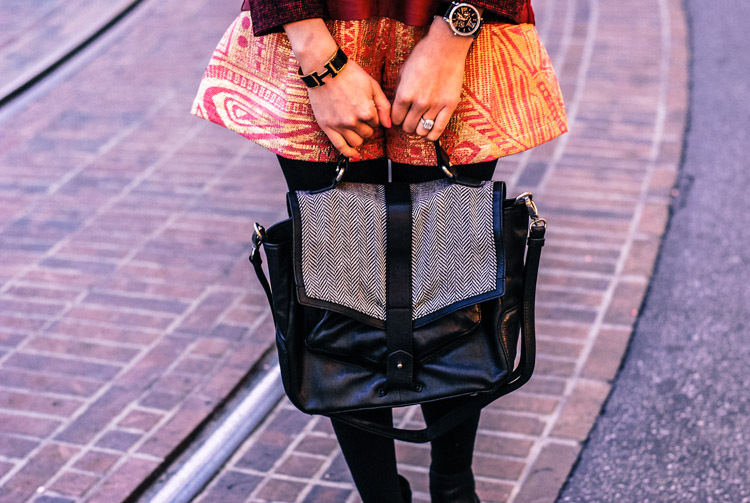 Such a great mix of patterns & textures! Love this look on you. totally in love with all the textures in this outfit. Hi sweety, you look stunning, love the interesting combination of beautiful fabrics and rich colours. Travel is good for gather knowledge and our refreshment. So every body should go on travel. What an awesome combo! Love the leather top with that skirt. you look amazing! Thanks for stopping by and commenting on my blog, it means a lot :). Those shorts are gorgeous, and LOVE your bag! Love your first snap..Very nice outfit. Love your outfit. The color combo is gorgeous.